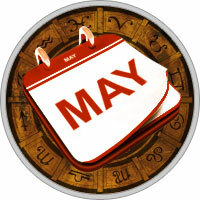 The sky is full of movement in the merry month of May!With Mercury gravitating in Aries till May 5, personal whims are coming out and the youth could be in a flurry. After the 5th and till the 20th, Mercury in Taurus will tint all the contacts and trips with sensuality, gormandize, with greed at times.Venus is in Aries till the 14th. She adds a flavor of will, audacity and impatience to the love-life and relations maintained with finance. Depending on the signs, these idealistic sensations could please or displease. On the 2nd fortnight Venus will embark in Taurus, her home sign, and will induce sensual contacts, somewhat exceptive, both in love and finance.Mars will stay in Gemini, with ardent but dispersed energy, and will pass into Cancer on the 15th, bringing the concerns back to home and family.On the 20th the Sun and Mercury together will enter Gemini offering us several weeks of pleasing excitement. The full Moon on the 20th promises to be particularly romantic and voluptuous at will.